CHICAGO, ILLINOIS—The American Writers Museum is pleased to announce the debut of Palm: All Awake in the Darkness, a newly commissioned immersive installation by artist duo Susannah Sayler and Edward Morris (Sayler / Morris) in collaboration with Ian Boyden. The installation is the museum’s first commissioned artwork and was made possible by support from The Poetry Foundation and additional support from The Merwin Conservancy. The installation includes living palms, a new video work by Sayler / Morris, and sound design that includes poetry by W.S. Merwin as well as Naomi Shihab Nye, Carrie Fountain, Ross Gay, Ezra Pound and a traditional Hawaiian chant sung by Dr. Pualani Kanaka'ole Kanahele. Palm is inspired by the life and work of the American poet W.S. Merwin and meditates on Merwin’s capacity to invoke in his readers a sense of the wakefulness of the world. Merwin is not only a celebrated poet, having won nearly every major poetry award, including the appointment of poet laureate, he is also a visionary gardener and environmentalist. Starting more than 30 years ago, Merwin and his wife Paula embraced a piece of certified wasteland in Hawaii and tree-by-tree grew one of the most species-rich palm gardens in the world – a garden that aspires to be a forest, as Merwin put it. In this installation, Sayler / Morris and Boyden make an analogy between gardening of the sort Merwin undertook on his land in Maui and writing. For Merwin, both activities were infused with a spirit of contemplation and awareness profoundly shaped by Merwin’s practice of Zen Buddhism. The installation is deeply contemplative. As viewers walk through three distinct spaces, the sound of poetry being recited by its authors come in and out of the threshold of hearing. Viewers enter through a facsimile of a shade house Merwin used to cultivate palms. When exiting the shade house, one enters a central area for viewing Sayler/Morris’ video made of footage and sounds taken in Merwin’s palm garden, paired with Merwin’s own recitation of selected poems. A final area with spot-lit palms and four speakers project the voices of both Merwin and three contemporary American poets who were influenced by his work: Naomi Shihab Nye, Carrie Fountain, and Ross Gay. For many years Merwin has made a practice of composting letters he receives from all over the world. Through this practice, the writings of those touched by Merwin’s work become part of the trees in his garden. At one end of the exhibition, visitors will have an opportunity to write their own message. To spur thoughts, Sayler / Morris provide the prompt Merwin gives in one of the keynote poems of the exhibition, “Place”: “On the last of the world / I would want to plant a tree / What for…” The artists will take all the messages collected in the course of the exhibition in “plant” them in Merwin’s garden. 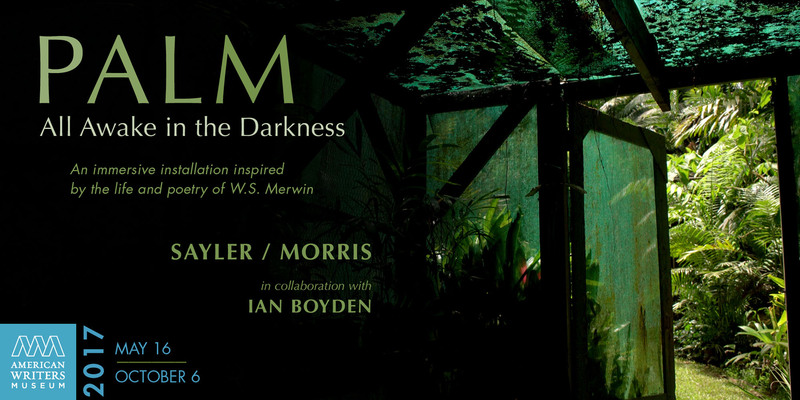 This is Sayler / Morris’ second large-scale installation in conversation with a major writer. In 2014-15, the duo worked with writer Elizabeth Kolbert on a large-scale video installation titled Eclipse that commemorated the extinction of the passenger pigeon at Massachusetts Museum of Contemporary Art (MASS MoCA). Sayler / Morris use diverse media and participatory projects to investigate and contribute to the development of ecological consciousness. They are also co-founders of The Canary Project, a studio that produces and supports art and media about ecological issues. Their work has been exhibited in diverse venues internationally, including: MASS MoCA, The Cooper Hewitt Design Museum, the Walker Art Center, The Kunsthal Museum in Rotterdam, The Museum of Contemporary Art/Denver, the Museum of Science and Industry (Chicago, IL), etc. Sayler / Morris have been Smithsonian Artist Research Fellows and Artist Fellows at The Nevada Museum of Art’s Center for Art + Environment. In 2008-2009 Sayler and Morris were Loeb Fellows at Harvard University’s Graduate School of Design. In 2016, they were awarded the 8th Annual David Brower Art/Act Award. They currently teach in the Transmedia Department at Syracuse University, where they co-direct The Canary Lab. Ian Boyden—artist, writer, and curator—investigates relationships between the self and the natural world. Linking the literary, material, and visual imaginations, Boyden’s work explores our awareness of and influence on our ecologies. Consistent across his productions are his interests in material relevance and place-based thought, as well as a deep awareness of East Asian philosophies and aesthetics. He studied for many years in China and Japan, and holds degrees in the History of Art from Wesleyan University and Yale University. In addition to his independent projects, he also collaborates with scientists, poets, composers, and other visual artists. He has exhibited widely, including a solo exhibition in China at the I.M Pei-designed Suzhou Museum. His books, paintings, and sculptures are found in many public collections including Reed College, Stanford University, the Portland Art Museum, and the Victoria & Albert Museum. Nirvana presents three monumental works that reflect my recent ecological explorations, in particular our relationship to carbon. The paintings explore a wondrous variety of stories of carbon—from the element's birth in super-giant stars to inhabiting the breath of forests—allowing these stories to unfold as dynamic compositions.